Where to begin ? Couple of years ago I looked in the garage and decided I needed another bike.. At the time I had three bikes on the road, all massively impractical, expensive and thirsty. What I needed was a cheap, fun bike, good around town and simple enough for me to maintain and tinker with. What I bought was a 70s Triumph Bonneville with a 60s Single carb engine and gearbox. I spent a few weeks getting it running, making new engine plates, re-tapping lots of damaged threads, new tyres.. it was turning into a money pit. Still it looked good, pity I hated riding it, it vibrated far worse than my big inch Harley, brakes were marginal and the suspension was clapped out. Thankfully a nice man came along and bought it for a price that meant I didn't lose any money on the whole nightmare. No pics, they were on my laptop that got stolen. So my search for a light, cheap, fun little bike continued..
With a new battery, oil change and fresh petrol, the Honda fired up straight away, and idled quietly.. I was a happy man. 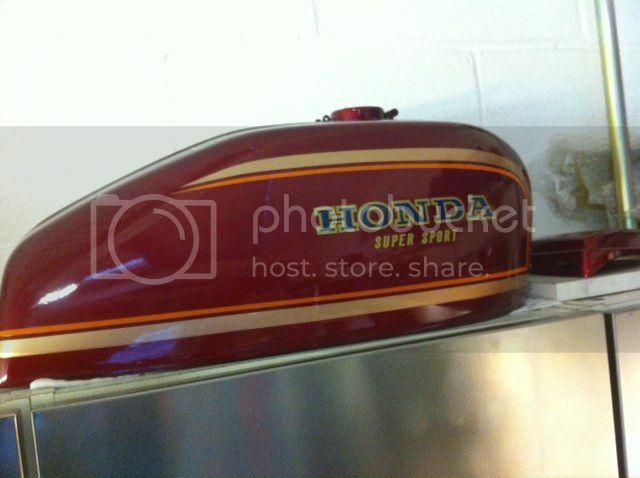 Those old Hondas are lovely bikes, it felt so small and slim compared to modern stuff. It wasn't very fast, but sounded cool at high revs with that old Dunstall exhaust. My plan was to slowly restore it, just doing small jobs over the summer but keeping it on the road. It needed a cosmetic restoration, the engine ran fine. Well, that was the plan..
That summer I was helping my mate out at his bike shop, so I turned up the first day on my little Honda and left it in a far corner, so as not to lower the tone amongst all the Ducatis, MVs and Jap superbikes they work on. I was amazed when just about every customer (mostly middle aged) made a bee line for the rusty Honda.. 'I had one of them ! ', 'is it for sale?' Can I have a go? How much do you want for it? .. I told everyone I'd only just got it and it wasn't for sale. Finally we get to the Guzzi.. 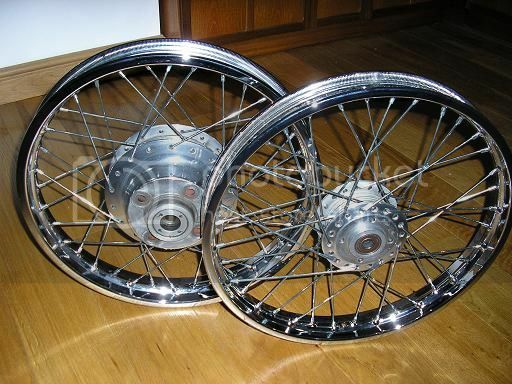 I decided I wanted a Tonti framed, carb model Guzzi. Early Lemans were already too expensive, even the boring touring models were getting expensive, except for one model that seemed to be overlooked by the classic mob. The California Mk3.. it didn't have the looks of the earlier models, but was the last model to have carbs and the classic Tonti Frame. 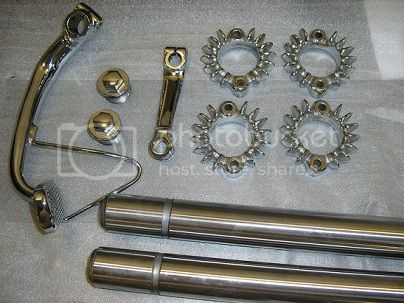 It also came with 18inch alloy rims and stainless spokes from the factory, a big bonus as far as I was concerned. Other folks had the same idea, and a few were being converted to Café racers or LeMans replicas, by fitting the LM lower frame rails (to fit rearsets in place of the Cali footboards) and a LM tank. I found my Cali one cold winters day, owned by a chap who races Guzzis. He'd made a start on converting the bike, but decided to sell as he didn't have the time to complete it. I couldn't hear it running, but it came with the all important LM frame rails and tank, and the documentation showed it had been used recently.. so I brought it home. The plan was to strip the bike down, get the frame powder coated, clean and polish everything, hopefully the motor wouldn't need much work.. rebuild it with minimum wiring, a single seat, a few upgrades here and there. such as delinking the brakes, braided hoses, make it lighter....and ride it. The engine in the Cali is tuned for torque rather than HP like the Lemans.. should make for a good everyday bike. 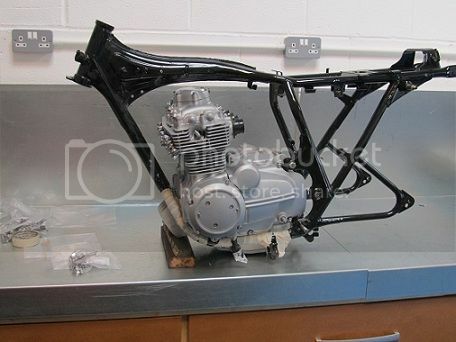 First step, strip the bike and lift the frame off the engine, a lot easier than lifting the engine from the frame. I took lots of photos along the way of every cable, wire, pipe, nut and bolt, all worthwhile when it comes time to put it all back together..
Start with something easy and cheap. Strip the rear bevel box and paint it..
Ditto for the rear swing arm. I was going to paint the frame the same way, but it turned out cheaper to get it powder coated, given the cost of materials these days.. I took the frame to a powder coater I hadn't used before, on the recommendation of a local restorer. They were cheap, but when I got the frame back I wasn't that impressed. The finish isn't as good as the usual place I use, they'd not bothered to protect the head races when they blasted the frame, also the swingarm threads had been powder coated, as had the chassis plate. Not the end of the world, but hassle I didn't need.. I tried to like the seat unit, but I cant, it'll have to go, it just doesn't work with the angular tank, nor does it sit right on the frame rails..